It's a great day to ride on the Pirate Water Taxi! Narrated daytime tours of Tampa with stops near Attractions, Museums, Restaurants & Parks! 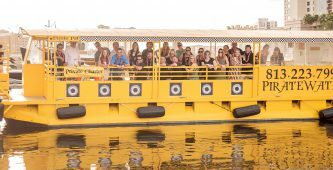 Get your group from one waterfront location to another, or create the perfect event on the water! Enjoy the Pirate Water Taxi Downtown all year long! Become an Annual Passholder today! Bring visiting guests or family with you to enjoy the water taxi without having to buy their ticket! Attending a show at the Straz Center (stop 14)? 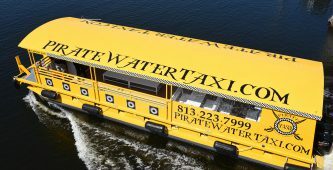 Hop on the Pirate Water Taxi shuttle departing from Armature Works (Stop 16) for a discounted fare. Annual passes are not valid for shuttles. Click here to view live updates on arrival times. 15 stops along the Hillsborough River and Tampa RiverWalk, near several Attractions, Museums, Restaurants & Parks! 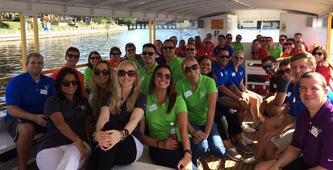 See Pirate Water Taxi events along the route throughout Downtown Tampa! Subscribe to our e-Newsletter to hear about events, upcoming specials and the latest news! Pirate Water Taxi vessels are available for private group charters. Create the perfect event on the water!